Lisa from Talk Functions shares how she planned Lindy and Zaids perfect day. Lindy & Zaid left the bustling City of London to come and enjoy a relaxed wedding and honeymoon in Cape Town. They chose Asara Wine Estate in Stellenbosch where guests can indulge in 5 Star Luxury accommodation, gourmet dining and wine tasting in glorious surroundings. Lindy wanted to create a day that was elegant, sophisticated and trendy. Her colour palette was champagne, gold, yellow, white and ivory. Her Bridesmaids were stylishly dressed in gorgeous yellow dresses. 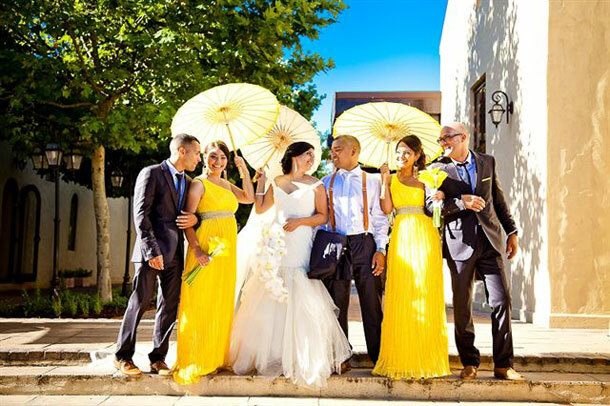 We accessorized them with yellow handheld parasols. The colour yellow represents many things including happiness and optimism. Lindy arrived in style in a Black Bentley Spur which was chauffeur driven. She was escorted down the aisle by her mom and stepdad to meet her future husband Zaid who was waiting patiently for her under the beautifully decorated Gazebo. The backdrop for the garden wedding was the amazing view of the Helderberg Mountains and vineyards. It was a warm summer’s day and the handheld fans which were handed out to the ladies as gifts came into good use. The guests were protected by the summer sun by two gazebo-like structures with soft white draping which danced in the slight breeze. After the Ceremony guests enjoyed a variety of well presented and tasty canapés and chilled thirst quenching cocktails. The solo artist strung away at his guitar strings with his gentle background melodies. After a long family photo session Lindy & Zaid were eventually whisked off by Du Wayne to enjoy their special moments together as Husband and Wife. The Reception was held in the Ballroom which we decorated with small and medium chandeliers and curtain fairy lights. Orchids, Tulips, Casablanca lilies and Calla lilies were displayed in modern glass vases of various shapes and heights. Personalized menus were placed at each setting. Lindy sourced the favours from Harrods in London. They were beautifully wrapped gold boxes filled with chocolate truffles. Lindy wanted to create a fine dining & dance experience throughout the evening so she decided to have the “first dance” before starters. The guests did not hesitate to join them afterwards for a waltz or two before dinner commenced. The Band entertained the guests with some light jazz music while they feasted on a spectacular 4-course meal. After the cutting of the cake Lindy & Zaid took to the dance floor yet again for their “second dance”. Later that evening we ushered the guests outside where the Fire Performers put on an amazing 20 minute show which included a “Fire Blessing” ritual for the couple. The guests headed back to the Ballroom afterwards where the DJ took over the reins and guests danced the night away. Du Wayne was in is element as usual capturing every moment and every detail to perfection. To book Lisa and her team at Talk Functions to create the perfect day for you telephone her on +27 (0)21 553-0389. Alternatively visit Talk Functions for further details or to send an enquiry. This is STUNNING!! Love all the table decor. have you got any ideas for snacks that i can put on the wedding tables.